If you had more self-discipline, could you increase your income? In this program you'll discover breakthrough techniques that will help you achieve your dreams. 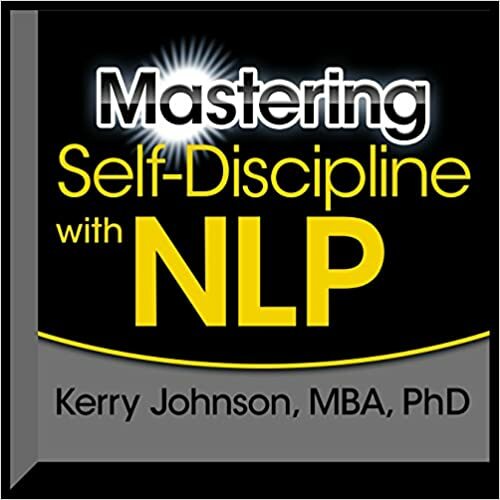 By artfully blending proven-effective techniques adopted from behavior therapy, cognitive psychology, and the science of neuro-linguistic programming (NLP), Kerry Johnson has devised a program that will empower you to exercise perfect, consistent self-discipline - automatically. This program gives you a simple, step-by-step plan for putting these powerful strategies to work in your life quickly, so you'll start to experience fantastic results right away. Already a mega best seller, this program is the finest ever produced on giving you more self-discipline. Whether we're starting out, striving toward a promotion, or looking for a new opportunity, the working world isn't what it used to be. Wall Street veteran Carla Harris knows this, and in Strategize to Win she gives listeners the tools they need to get started; get "unstuck" from bad situations; redirect momentum; and position themselves to manage their careers no matter the environment. Tuning into unspoken cues; and thriving through change. Introducing a new way to planning one's career in five-year units, Strategize to Win distills battle-tested and step-by-step tools that Carla has used to launch and sustain her own successful career and help others move forward, recover from setbacks, and position themselves for success. A forgotten book by one of history's greatest thinkers reveals the surprising connections between happiness, virtue, fame, and fortune. Adam Smith may have become the patron saint of capitalism after he penned his most famous work, The Wealth of Nations. But few people know that when it came to the behavior of individuals-the way we perceive ourselves, the way we treat others, and the decisions we make in pursuit of happiness-the Scottish philosopher had just as much to say. He developed his ideas on human nature in an epic, sprawling work titled The Theory of Moral Sentiments. Most economists have never read it, and for most of his life, Russ Roberts was no exception. But when he finally picked up the book by the founder of his field, he realized he'd stumbled upon what might be the greatest self-help book that almost no one has read. In How Adam Smith Can Change Your Life, Roberts examines Smith's forgotten masterpiece, and finds a treasure trove of timeless, practical wisdom. Smith's insights into human nature are just as relevant today as they were three hundred years ago. What does it take to be truly happy? Should we pursue fame and fortune or the respect of our friends and family? How can we make the world a better place? Smith's unexpected answers, framed within the rich context of current events, literature, history, and pop culture, are at once profound, counterintuitive, and highly entertaining. By reinvigorating Smith's neglected classic, Roberts provides us with an invaluable look at human behavior through the lens of one of history's greatest minds. Bestselling author Jon Gordon returns with his most inspiring book yet-filled with powerful lessons and the greatest success strategies of all. In this audiobook, Seth Adam Smith expands on the philosophy behind his extraordinary popular blog post "Marriage Isn't for You" - which received over 30 million hits and has been translated into over twenty languages - and shares how living for others can enrich every aspect of your life, just as it has his. With a mix of humor, candor, and compassion, he reveals how, years before his marriage, his self-obsession led to a downward spiral of addiction and depression, culminating in a suicide attempt at the age of twenty. Reflecting on the love and support he experienced in the aftermath, as well as on the lessons he learned from a difficult missionary stint in Russia, his time as a youth leader in the Arizona desert, his marriage, and even a story his father read to him as a child, he shares his deep conviction that the only way you can find your life is to give it away to others. "All seekers of truth yearn for the mystical experience. In this remarkable journey, you do not walk alone. With you is your indispensable partner to success-the spiritual hierarchy." In their newest book, award-winning authors Barbara Y. Martin and Dimitri Moraitis explore the sacred art of communing with celestial beings. Reading of Martin's extensive direct clairvoyant experiences, this book will teach you to work closely with angels, archangels, and other divine beings who guide you in day-to-day living and help you achieve your destiny. You will learn how to strengthen your intuitive powers and hear what the divine is telling you, and thrill to accounts of Martin's compelling personal encounters with celestial beings and her eye-opening encounters with dark spirits. Communing with the Divine is a practical training manual and an inspirational guide, with full-color illustrations of celestial beings and their auric composition. Humanity has lost itself. Both as individuals and as a world culture, we have forgotten our true nature. In I Am the Word, writer and medium Paul Selig has recorded an extraordinary program for self- realization, as dispensed through beings of higher intelligence, sometimes called Guides or Ascended Masters. These figures seek, as they have in the past, to assist men and women in discovering the higher, purposeful nature-or "Christed Self"-that lies dormant within us all. In a series of enticing, irresistibly practical dialogues, the Guides of I Am the Wordidentify the emotional "boulders" that displace our authentic selves and consume our potential. The Guides provide to-the-point psychological and existential insights, along with self-developing exercises and affirmations, which begin to strip away residues of fear, self-doubt, and self-suffocating habits. Eighty percent of all sales are made by just twenty percent of sales people. What's surprising to discover is that those top professionals perform only a bit better than their peers in certain critical areas. By excelling in these capabilities, you can earn money faster, have more success, and gain greater career satisfaction than you ever thought possible. Packed with proven strategies and priceless insights, this informative audiobook will help you take your sales game to unprecedented new heights. The success or failure of your business depends on the success or failure of your marketing efforts. If you can identify what your customers want, need, and can afford - and then give it to them - you will achieve outstanding results. Filled with Brian Tracy's trademark wisdom, this indispensable guid contains 21 powerful ideas you can use to immediately improve your strategic marketing results. Packed with time-tested marketing strategies, this practical and portable audiobook shows you how to overcome the competition, increase sales and profitability, and dominate your market niche. When Co-Active Coaching was first released in 1998, this pioneering work set the stage for what has become a cultural and business phenomenon and helped launch the profession of coaching. Published in more than 10 languages now, this book has been used as the definitive resource in dozens of corporate, professional-development, and university-based coaching programs, as well as by thousands of individuals looking to elevate their communication, relationship, and coaching skills. In Love and Math, renowned mathematician Edward Frenkel reveals a side of math we've never seen, suffused with all the beauty and elegance of a work of art. In this heartfelt and passionate audiobook, Frenkel shows that mathematics, far from occupying a specialist niche, goes to the heart of all matter, uniting us across cultures, time, and space. Love and Math tells two intertwined stories: of the wonders of mathematics and of one young man's journey learning and living it. Having braved a discriminatory educational system to become one of the twenty-first century's leading mathematicians, Frenkel now works on one of the biggest ideas to come out of math in the last 50 years: the Langlands Program. Considered by many to be a Grand Unified Theory of mathematics, the Langlands Program enables researchers to translate findings from one field to another so that they can solve problems, such as Fermat's last theorem, that had seemed intractable before. At its core, Love and Math is a story about accessing a new way of thinking, which can enrich our lives and empower us to better understand the world and our place in it. It is an invitation to discover the magic hidden universe of mathematics. Thomas Buergenthal, now a Judge in the International Court of Justice in The Hague, tells his astonishing experiences as a young boy in his memoir, A Lucky Child. He arrived at Auschwitz at age 10 after surviving two ghettos and a labor camp. Separated first from his mother and then his father, Buergenthal managed by his wits and some remarkable strokes of luck to survive on his own. Almost two years after his liberation, Buergenthal was miraculously reunited with his mother, and in 1951 he arrived in the U.S. to start a new life. Now dedicated to helping those subjected to tyranny throughout the world, Buergenthal writes his story with a simple clarity that highlights the stark details of unimaginable hardship. A Lucky Child is an audiobook that demands to be heard by all. "Less is more" - or, more specifically, the less you have to do, the more life you have to live. Efficiency expert Ari Meisel details his "Less Doing" philosophy, which will streamline your life, and make everything easier. In business and our personal lives, it often seems as if the only way to get more done is by putting in more time - more hours at the office, more days running errands. But what if there were a way that we could do less, and free up more time for the things and people we love? If this sounds like what you need, Ari Meisel - TEDx speaker, efficiency consultant, and achievement architect - has the program for you. In Less Doing, More Living, Meisel explores the fundamental principles of his “Less Doing” philosophy, educating the listener on: Optimizing workflow with 21st-century apps and tools. Creating an “external brain” in the Cloud to do all of your “lower” thinking - like keeping track of appointments, meetings, and ideas. How to use technology to live a paper-free life. The three fundamentals of wellness - fitness, sleep, and nutrition - and technological approaches to improving these areas of life. And so much more! This audiobook will give listeners new tools and techniques for streamlining their workload, being more efficient in their day-to-day activities, and making everything in life easier. Optimists have always said, in essence, that there’s nothing to worry about—that confidence in the dollar will never truly be shaken, no matter how high our national debt or how dysfunctional our government. But in the last few years, the risks have become too big to ignore. While Washington is gridlocked and unable to make progress on our long-term problems, our biggest economic competitors—China, Russia, and the oil producing nations of the Middle East—are doing everything possible to end U.S. monetary hegemony. The potential results: Financial warfare. Deflation. Hyperinflation. Market collapse. Chaos. The aim of David McAdams’s Game-Changer is nothing less than to empower you with this wisdom - not just to win in every strategic situation (or “game”) you face but to change those games and the ecosystems in which they reside to transform your life and our lives together for the better. The book then digs into several real-world strategic challenges, such as how to keep prices low on the Internet, how to restore the public’s lost trust in for-charity telemarketers, and even how to save mankind from looming and seemingly unstoppable drug-resistant disease. In each case, McAdams uses the game-theory approach developed in the book to identify the strategic crux of the problem and then leverages that “game-awareness” to brainstorm ways to change the game to solve or at least mitigate the underlying problem. So get ready for a fascinating journey. You’ll emerge a deeper strategic thinker, poised to change and win all the games you play. In doing so, you can also make the world a better place. “Just one Game-Changer [is] enough to seed and transform an entire organization into a more productive, happier, and altogether better place,” McAdams writes. Just imagine what we can do together. To those who don't speak it, the language of money can seem impenetrable and its ideas too complex to grasp. How to Speak Money is acclaimed writer John Lanchester's entertaining and informative attempt to bridge the gap between the money people and the rest of us. With characteristic wit and candor ("wickedly funny" - Dwight Garner, New York Times), Lanchester shows how the world of finance and economics really works - from the terms and conditions of your personal checking account to the evasions of bankers appearing in front of Congress. Although it may require a lifetime of study to grasp, the best-selling A Course in Miracles has inspired millions. Perhaps its most essential lesson is 101: The belief that there is no sin and that God's will for us is perfect happiness. Longtime teacher Jon Mundy digs deeply into this concept, providing an insightful and clear path through one of the manual's most meaningful and complex lessons. In Against the Grain, Bill Courtney shares his convictions on the fundamental tenets of character, commitment, service, leadership, civility, and others that, in his decades of success as an entrepreneur and educator, have proven to be the keys to a winning and meaningful life and career. Each chapter tells the story of one of these tenets through compelling anecdotes of the colorful characters in Bill’s life, leading to a deeper understanding of the meaning of each and how to employee these fundamentals in all aspects of one’s life. Against the Grain intertwines inspiring and thought-provoking anecdotes, lessons, and amazing real-life examples. Bill’s passion for us all to reconsider our own approach to life and constantly improve upon it comes across in every minute. The best-selling book on academic writing - in use at more than 1,500 schools. Everyone knows that the first rule of sales is “always be closing”. But what if the less time you spend trying to close, the more time you can devote to helping people solve problems and seize opportunities? And what if following the new rule of sales, “always be useful”, results in more business? If you sell and if you aim to sell better, you need to know about the stranger’s dilemma. A stranger doesn’t have the leverage of instant credibility. So it’s not surprising that a wide range of sales tactics, tools, and closing techniques have been developed as a substitute for credibility. Their purpose is often to wrangle a commitment to buy, even when buying may not be in the best interests of the client. The approach advocated in Never Be Closing is designed to overcome the stranger’s dilemma, but in a very different way. This audiobook is a comprehensive strategy that starts with a well-researched process for identifying and solving problems. It shows you how to access your creativity to establish and maintain relationships that will be truly useful for both you and your clients over time. In a very real sense, this book will show you how to become less of a stranger. Never Be Closing expands on the principles of Tim Hurson’s first audiobook, Think Better, by offering a simple and repeatable Productive Selling framework to make the most of new opportunities. From getting your foot in the door to delivering the perfect sales pitch to debriefing after a meeting, Hurson and Dunne have an all-encompassing plan to improve your sales results, including: Eight Paths to Credibility, proven methods that establish your authority to ask key questions that reveal your client’s issues, challenges, and goals. Q-Notes, a powerful strategy to make your notes doubly useful - to both record and guide your sales meeting. Three-Act Structure, a creative way to design the sales conversation to explore client needs, offer solutions, and deliver value. Can you make yourself, your kids, and your parents smarter? Expanding upon one of the most-read New York Times Magazine features of 2012, Smarter penetrates the hot new field of intelligence research to reveal what researchers call a revolution in human intellectual abilities. Shattering decades of dogma, scientists began publishing studies in 2008 showing that "fluid intelligence" - the ability to learn, solve novel problems, and get to the heart of things - can be increased through training. But is it all just hype? With vivid stories of lives transformed, science journalist Dan Hurley delivers practical findings for people of every age and ability. Along the way, he narrates with acid-tongued wit his experiences as a human guinea pig, road-testing commercial brain-training programs, learning to play the Renaissance lute, getting physically fit, even undergoing transcranial direct-current stimulation. Smarter speaks to the audience that made best-sellers out of Train Your Mind, Change Your Brain, and Moonwalking with Einstein. More than any other practice in your career, your ability to manage time will determine your success or failure. It’s a simple equation. The better you use your time, the more you will accomplish, and the greater your rewards will be. Filled with Brian Tracy’s trademark wisdom, this audiobook will help you get more done, in less time…and with much less stress.